At Kalsec® all mechanisms causing oxidative deterioration are reviewed to provide maximum protection resulting in prolonged shelf life of your products. Our Duralox® Oxidation Management Systems are based on the use of Herbalox® Rosemary Extract, green tea, acerola and/or mixed tocopherols, plus the addition of quenchers and/or chelators. Utilizing component synergism, Duralox® Oxidation Management Systems provide maximum protection from multiple aspects of oxidative deterioration. Duralox® Oxidation Management Systems are designed for specific product and processing conditions unique to each application. Clinical data suggest many health benefits associated with omega-3’s. Omega-3 oils are noted for their high concentration of polyunsaturated fatty acids (PUFA). As a result, these oils are extremely susceptible to oxidation, which results in free radicals, off flavors and odors, and reduced shelf life. Herbalox® Rosemary Extracts and Duralox® Oxidation Management Systems enhance omega-3 oils with improved stability and significant increases in shelf life. A Duralox® Oxidation Management System was added to fish oil emulsion to improve shelf life for a dairy application. 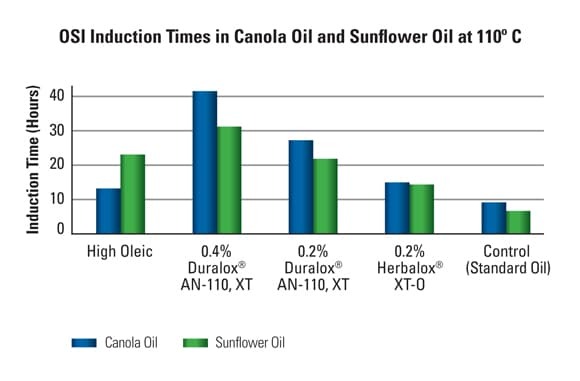 Kalsec® Herbalox® Rosemary Extracts and Duralox® Oxidation Management Systems offer economical, naturally sourced partially hydrogenated oils (PHOs) alternatives when added to standard canola and sunflower oils, contributing the same stability found in PHOs. Specialty high oleic oils can also increase oil stability, but typically are significantly more expensive than their standard oil counterparts. The addition of Kalsec® antioxidants to standard canola and sunflower oils can improve both performance and economics over high oleic oils.